Burning Moon's Inside advice: Plum Paper Planner Review + Giveaway!! I like to keep organized lists because I am not a person who is able to remember all of the important dates, appointments, etc that I have through out the month off the top of my head. When looking for new planners to use I like to look for planners that offer a great layout and plenty of space to create to do lists, write out event information and notes. I recently came upon a company called Plum Paper who offers a selection of planners, notebooks and more that can all be customized. I was offered the chance to review one of their twelve month planners and was able to use their website to create the perfect planner for me. The website is very simple to navigate, the first step is just deciding on which size & layout you'd like, I went with the 7" x 9" planner with the notes and dates layout. If you are unsure about any of the options they have it to where you can preview everything before making your final decision which is a fantastic site feature. Next you'll pick out the cover design you want, they offer nine different sections such as floral and repeat shapes with over seventy designs to select from. The front cover can be customized several different ways, you can add a photo or text. For my cover I went with the turquoise butterfly pattern with the year in the top corner and added a Disney quote to the bottom. Next up in the process is customizing the interior of your planner! You'll be able to adjust the layout of the pages, select the month you'd like your planner to start/end in and select the binding you want. The last step in the creating process is to select add-on pages if you'd like them, they offer a large variety of extra pages including to do lists, wedding planning pages, meal plan pages, budget planner and tons more. I opted for the to do list pages and a blog pages section for my planner. My planner arrived significantly quicker than I expected, considering that several aspects of the planner were customized.The cover is pretty sturdy on it's own being both water proof and tear proof, but to add an extra level of insurance they also included a clear plastic cover on the front and the back of the planner to protect it from harm. For being a pretty hefty planner (about two inches thick due to the add-ons I selected) it is surprisingly light and easy to bring with me on a day to day basis. Each month starts off with a section to write goals, birthdays,events, and things to remember followed by a lined page for notes. It also includes a calendar for the month, plus each week has it's own section of pages for more notes and reminders. I do wish I had selected a different add-on instead of picking the blogging section because although it is extremely helpful I have a separate book I like keeping my blogging notes in and I don't see myself using this section as much, but that was my own mistake not Plum Paper. For the planner I selected and the add-ons I selected the total of my planner came out to $47.50, the planner itself is a base price of $32 and the add-on's range in price from $3 to $12.50. I've had several planners in the past but they usually end up torn up or dirty because I am constantly carrying it around with me, but I don't see that happening with this planner because of how well made everything is. I am very happy with this planner and I look forward to using it over the next year. One lucky reader is going to win the 7" x 9" planner shown above. It is a twelve month planner that has June 2018 to May2019, it has a contacts section, a pocket, plus two graph pages and a passwords page. Please note that although this giveaway is open World Wide, Plum Paper only ships to 28 countries so if you'd like to place an order please check their list of the countries they serve. Giveaway entry question: Please leave me a comment letting me know how this planner would be helpful to you. My wife has been telling me she needs a planner! I really have to check this company out, see about getting her a custom planner maybe for mothers day! I tried to get organized using my iPhone, but it just isn't the same as writing it down on paper. I'm really trying to stay proactive about planning and keeping on top of my busy schedule. My current planner expires in June,so this would help me a lot. Thanks so much for this giveaway! I am really disorganized and have a hard time keeping track of things. This would be so useful. I have suddenly become busier than typical, it would help to organize my activities! I would love this planner!! I need something to help me remember everything I need to do each week. I can't remember it all. I have Crohn's and have to take Humira injections, so this would be helpful for that. It would also help with all my doctor's appointments as well as everything that I need to remember with my 2 kids. I need a planner in my life! I need it to keep track of 5 kids schedules. This would be awesome for keeping my more organized during the school year with kids activities and stuff! I'm a busy mom and this would help me keep track of things! Having four kids, working full time, and going back to college, this would help me have a visual of everything that needs to be done and all our schedules in one place. I'd use it to write down birthdays, appointments, and my work schedule. Thanks. I would be helpful for me because college is stressful and I need to keep track of all of my assignments. I need it because college is stressful and I need to keep track of all of my assignments. This planner would help me because I am overwhelmed and unorganized. This would help me a lot for school and all the things with my children, just to stay organized and keep my notes, lists, and everything else in order. Thank you! I have 4 kids, and I really need a planner to keep everything straight. Thanks for the chance. This planner would help me to keep up with important appointments and to know of things coming up that I need to do ! This would help my keep track of our family's schedule. This planner would help me keep track of all out appointments I seem to forget about! I need some organization in my life! This would help me- I have been having back pain and I need to start tracking my food and movement to try to find the problem. I love that there are so many add on pages you can get. This would help me keep medical info and appointments straight and meal planning would be easier. This would be helpful for keeping my home life straight. This would be useful for school. I'm constantly forgetting things- so yes! I’m not organized at all! This would help! A planner would be amazing for me! I need to get organized asap. 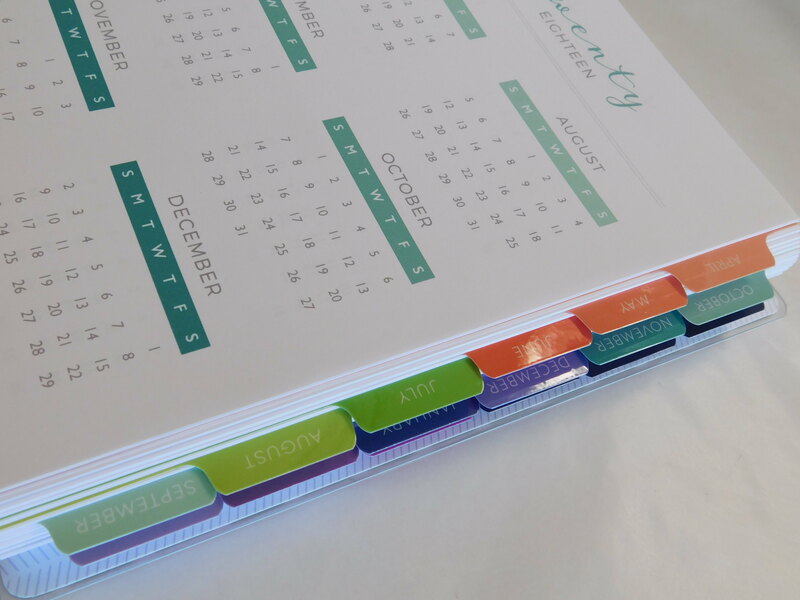 This would help me organize all of my appointments and events! I am very unorganized about that. This is going to be a enormous help with all the features. This planner would help me out tremendously. I have lots of doctor's appointments and lots of meetings to keep up with a planner would be perfect to help me keep track of everything. I love writing things down so that I can remember everything! We stay pretty busy throughout the year, so I try to stay as organized as I can. To keep organized! Thank you! It would keep me so much with my new blog. I cannot function without a planner and I've been meaning to look for a new one..I've just about fun out of room in mine! I use it as Command Central. Thanks so much for the chance! This planner would help me stay organized and on track! With 3 kids in all different activities on top of my job and appointments, it's hard to keep up!